I have noticed that some of my friends have been giving out their password to random people in Wizard101 or on Facebook. 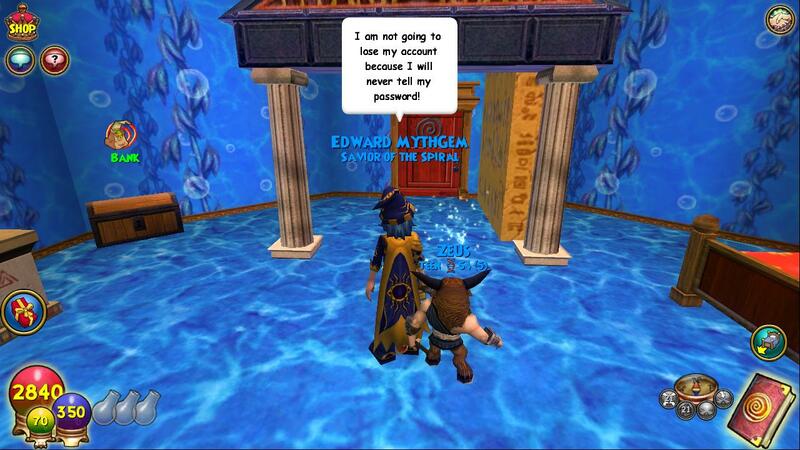 I always read below when I log into Wizard101 waiting for it to patch, it says never give out your password. It's very simple not to give out your personal information. There are some things people say that some people think is true when they say it. Here a couple of examples that people do to get your password. 1. I will give you a lot of crowns if you give me your password. I promise I will give it back. I can give you 100,000 crowns or so on. I can give you a 60$ or year membership! 2. I can help you level your characters, I will level them to all legendary. I promise I will give you your account back if you give me your password and user name! 3. One other thing that I have noticed that some people do, they use kingsisle saying that their parents or they work for kingsisle. Kingsisle says never give out your password to anyone, not even them. So if you see someone posing as kingsisle, report them. One story I had with this situation was that someone said that they could show me the new world Celestia. I knew something was weird about it so I decided to check it out, and my friends went too. I went there and he sent me a message asking for my user name and password! Now this is something that is simple enough to read when you log into the log in screen. Don't give out your password. I am glad I read that before I logged in that day because I might not have had Wizard101 right now if I did. 4. Some sites pose as something that they aren't. This kind of goes with example one. They ask for your user name and password and promise they will help you get a membership or crowns. They actually posted it on the Wizard101's Facebook page, which will be noticeable to Lydia Greyrose or Dalia Falmea. Remember, even if someone promises you anything of these things, Don't give out your password! You would also be giving out personal information, like credit card information, emails, and a lot of other stuff. Please don't let this happen to you, and read the log in screen. I know this won't help everyone that gives out their password, I really hope it helps those who does read my blog though. ~ NEVER tell your password to anyone! Violations will result in a permanent account ban! I am very sorry to those that did make that mistake though. I am sure it is terrible that you had to lose your acccount. I am just giving a warning to those who are about to do the same.